Calcium gluconate: Makes up for deficiency of calcium, which is necessary for neural impulses transmission, skeletal and unstriated muscles contraction, forming of the bone tissue, blood clotting process. It increases body tolerance to infections, has antiallergic effect. Calcium gluconate with the taste of orange / of apple: Makes up for deficiency of calcium, which is necessary for neural impulses transmission, skeletal and unstriated muscles contraction, forming of the bone tissue, blood clotting process. It increases body tolerance to infections. Calcium gluconate: Calcium gluconate – 300.0 mg, sugar – 160.0 mg, potato starch – 25.0 mg, calcium stearate – 10.0 mg, Aerosil – 5,0 mg.
Calcium gluconate with the taste of orange: Calcium gluconate – 440.0 mg, sugar – 303.2 mg, potato starch – 32.0 mg, malic acid – 16.0 mg, calcium stearate – 8.0 mg, Orange flavor – 0.8 mg.
Calcium gluconate with the taste of apple: Calcium gluconate – 440.0 mg, sugar – 303.2 mg, potato starch – 32.0 mg, malic acid – 16.0 mg, calcium stearate – 8.0 mg, Apple flavor – 0.8 mg.
Calcium is a most important microelement, which is necessary for human body functioning and is received with food. Calcium ions participate in blood clotting process, cell membranes permeability regulation, and neural impulses transmission; they take part in regulation of most various biochemical processes – hormones secretion, muscular contractions etc. About 90% of the total amount of calcium in the body is contained in the bones and the teeth. Main sources of calcium for human body are dairy (cottage cheese, milk, cheeses), fish, soya products, beans, peanut, walnut, sunflower seeds, green vegetables (broccoli, celery, parsley, cabbage), garlic, radish. Calcium deficiency in the pregnant may cause calcium wash-out from the bones and teeth of the future mother, what further results in problems with the teeth and premature osteoporosis development. Calcium gluconate: Adults and children since the age of 14 take 3-4 tablets a day, children from 7 to 14 years take 2-3 tablets a day, children from 3 to 7 years take 1 tablet twice a day before meals. 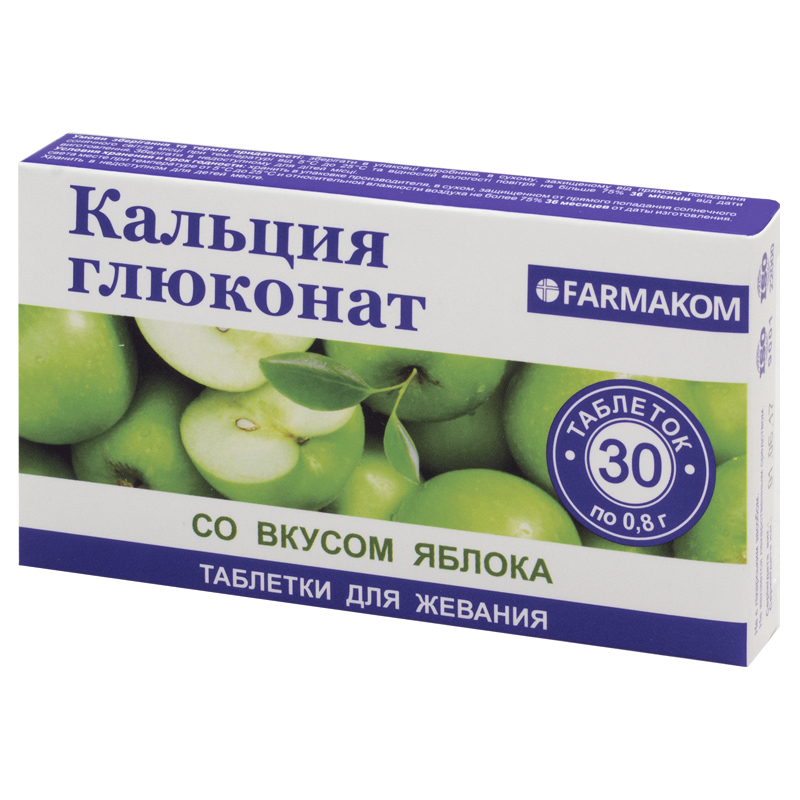 Calcium gluconate with the taste of orange / of apple: Chewable calcium gluconate is taken before meals; chew a tablet and wash down with water. Adults and children since the age of 14 take 3-4 tablets a day, children from 7 to 14 years take 2-3 tablets a day, children from 3 to 7 years take 1 tablet twice a day. Hypersensitivity to certain components, hypercalcemia, hypercoagulation, predisposition to thrombophilia, apparent atherosclerosis, hypercoagulability, nephrourolithiasis (calcium stones), acute renal failure, sarcoidosis, children under 3. Calcium gluconate: Proteins – 0.005 g, carbohydrates – 35.85 g, fats – 0 g.
Calcium gluconate with the taste of orange / of apple: Proteins – 0.004 g, carbohydrates – 40.95 g, fats – 0 g.